Pressidium is a relatively new web hosting company that was set up in 2014 by a group of four talented IT professionals and software developers. Within a very short period of time, Pressidium has been able to develop some interesting services and packages to offer high quality WordPress hosting to customers. 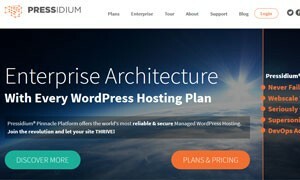 Unlike other companies such as BlueHost and JustHost that offer a competitive range of hosting services, Pressidium maintains an exclusive focus on WordPress hosting. The company has developed operations on a global scale and offers its services to clients around the world. One of the features of Pressidium is that it offers the same level of backup services for each of its three service packages. Pressidium offers instant backup services that create backups of all sites of clients on a daily basis. Instant backup can be prepared at the click of the mouse button. The attractive feature of instant backup services is that clients are not charged extra for the service. Pressidium offers four different hosting plans with scalable features. All plans are offered under a 60-day full refund trial period which is in line with the one month current trends in the market. The personal plan starts at $49.90 a month and includes 10GB HA SSD capacity and unlimited bandwidth for three WordPress installs. At the same time, the client’s visits are restricted to 30,000 a month. The professional plan starts at $149.90 a month and offers more than 3 WordPress installations while offering 20GB HA SSD storage. The business plan is developed for clients who anticipate up to 500,000 visits a month and begins at $299.90 a month. Up to 25 WordPress installs are included along with 30GB HA SSD storage space. The micro plan is a special feature of Pressidium and begins at $24.90 a month for up to 10,000 site visits a month and 5GB storage. One of the convenient things about Pressidium is that it has a robust 24/7 live chat service that offers adequate tech support. This is a significant advantage it has over other companies such as BlueHost and JustHost which do not have a live chat support service. As far as the number of servers is concerned, Pressidium has a global presence and maintains servers in North America, Japan, Southeast Asia, Oceania and Europe. Since the company is relatively new and competes in a niche segment of WordPress hosting, the number of accounts hosted is fewer than those hosted by BlueHost and JustHost that offer a larger range of web hosting services. Pressidium has developed a strong suite of web hosting services for its WordPress platform. It has developed a unique Pinnacle platform that offers highly useful features including the instant automated backup feature, WordPress development staging sites and automated updates. The traditional features that come with WordPress hosting such as SSL, HA SSD storage and content development networking are also included in all the service plans of the company. Interestingly, the company does not offer any email hosting services to its clients which means that clients will need to make separate arrangements to get an email account with their domain name. One of the difficult things about Pressidium is that the company does not have an adequate mechanism for identifying authentic visits. This can be problematic because like all WordPress Hosting Companies, Pressidium also charges clients on the basis of number of site visits. As long as the method the company uses to calculate site visits is fair, it is likely to attract a growing number of clients in the coming days. Compared with JustHost, Pressidium offers a highly specialized hosting service since JustHost offers shared hosting, VPS hosting and Dedicated hosting plans. Similarly, BlueHost also offers the same range of services as JustHost. In comparison, Pressidium comes across as a highly specialized and significantly expensive company, but compared with companies that offer WordPress hosting services, their plans are quite competitive. In particular, the services offered by Pressidium are well suited for companies with heavy traffic to their websites and those that require high speeds and large storage capacities. Smaller companies will have their needs better satisfied by companies that offer general hosting services.